Heino Falcke is a German professor of radio astronomy and astroparticle physics at the Radboud University Nijmegen. He was a winner of the 2011 Spinoza Prize. His main field of study is black holes. In 2013, a team under his lead earned a 14 million euro research grant from the European Research Council to further studies of black holes. Michael Kramer is a German radioastronomer and astrophysicist. Luciano Rezzolla is an Italian professor of relativistic astrophysics and numerical relativity at the Goethe University Frankfurt. His main field of study is the physics and astrophysics of compact objects such as black holes and neutron stars. Submillimetre astronomy or submillimeter astronomy is the branch of observational astronomy that is conducted at submillimetre wavelengths of the electromagnetic spectrum. Astronomers place the submillimetre waveband between the far-infrared and microwave wavebands, typically taken to be between a few hundred micrometres and a millimetre. It is still common in submillimetre astronomy to quote wavelengths in 'microns', the old name for micrometre. Polarization is a property applying to transverse waves that specifies the geometrical orientation of the oscillations. In a transverse wave, the direction of the oscillation is perpendicular to the direction of motion of the wave. A simple example of a polarized transverse wave is vibrations traveling along a taut string (see image); for example, in a musical instrument like a guitar string. 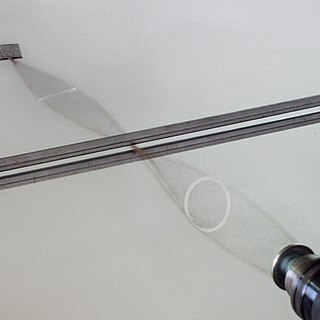 Depending on how the string is plucked, the vibrations can be in a vertical direction, horizontal direction, or at any angle perpendicular to the string. In contrast, in longitudinal waves, such as sound waves in a liquid or gas, the displacement of the particles in the oscillation is always in the direction of propagation, so these waves do not exhibit polarization. Transverse waves that exhibit polarization include electromagnetic waves such as light and radio waves, gravitational waves, and transverse sound waves in solids. In some types of transverse waves, the wave displacement is limited to a single direction, so these also do not exhibit polarization; for example, in surface waves in liquids, the wave displacement of the particles is always in a vertical plane. Sneakernet is an informal term for the transfer of electronic information by physically moving media such as magnetic tape, floppy disks, compact discs, USB flash drives or external hard drives from one computer to another; rather than transmitting the information over a computer network. Haystack Observatory is an astronomical observatory owned by Massachusetts Institute of Technology (MIT). It is located in Westford, Massachusetts (US), approximately 45 kilometers (28 mi) northwest of Boston. Haystack was initially built by MIT's Lincoln Laboratory for the United States Air Force and was known as Haystack Microwave Research Facility. Construction began in 1960, and the antenna began operating in 1964. In 1970 the facility was transferred to MIT, which then formed the Northeast Radio Observatory Corporation (NEROC) with a number of other universities to operate the site as the Haystack Observatory. As of January 2012, a total of nine institutions participated in NEROC. 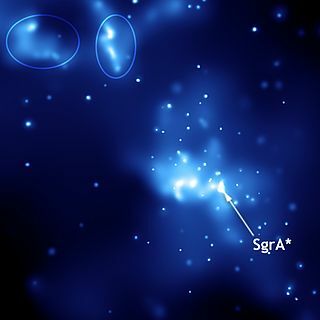 Sagittarius A* is a bright and very compact astronomical radio source at the center of the Milky Way, near the border of the constellations Sagittarius and Scorpius. It is likely the location of a supermassive black hole, similar to those generally accepted to be at the centers of most if not all spiral and elliptical galaxies. The Submillimeter Array (SMA) consists of eight 6-meter (20 ft) diameter radio telescopes arranged as an interferometer for submillimeter wavelength observations. It is the first purpose-built submillimeter interferometer, constructed after successful interferometry experiments using the pre-existing 15-meter (49 ft) James Clerk Maxwell Telescope and 10.4-meter (34.1 ft) Caltech Submillimeter Observatory as an interferometer. All three of these observatories are located at Mauna Kea Observatory on Mauna Kea, Hawaii, and can be operated together as a ten element interferometer in the 230 and 345 GHz bands. The baseline lengths presently in use range from 16 to 508 meters, and up to 783 meters (2,569 ft) for eSMA operations. The radio frequencies accessible to this telescope range from 180–418 gigahertz (1.666–0.717 mm) which includes rotational transitions of dozens of molecular species as well as continuum emission from interstellar dust grains. Although the array is capable of operating both day and night, most of the observations take place at nighttime when the atmospheric phase stability is best. Fulvio Melia is an Italian-American astrophysicist, cosmologist and author. He is professor of physics, astronomy and the applied math program at the University of Arizona and was a scientific editor of The Astrophysical Journal and an associate editor of The Astrophysical Journal Letters. A former Presidential Young Investigator and Sloan Research Fellow, he is the author of six English books and 230 refereed articles on theoretical astrophysics and cosmology. Feryal Özel is a Turkish-American astrophysicist born in Istanbul, Turkey, specializing in the physics of compact objects and high energy astrophysical phenomena. As of 2019, Özel is a professor at the University of Arizona in Tucson, in the Astronomy Department and Steward Observatory. Laura Ferrarese is a researcher in space science at the National Research Council of Canada. Her primary work has been performed using data from the Hubble Space Telescope and the Canada-France-Hawaii Telescope. Daniel Batcheldor is an Anglo-American astrophysicist, a professor at Florida Institute of Technology, Head of the Department of Aerospace, Physics and Space Sciences, and Director of the Jacobus Kapteyn Telescope. The Greenland Telescope is a radio telescope that is currently installed and operating at the Thule Air Base in north-western Greenland. It will later be deployed at the Summit Station research camp, located at the highest point of the Greenland ice sheet at an altitude of 3,210 meters. The CHIRP algorithm is a Bayesian algorithm to perform a deconvolution on images created in radio astronomy. The acronym was coined by lead author Katherine Bouman in 2016. 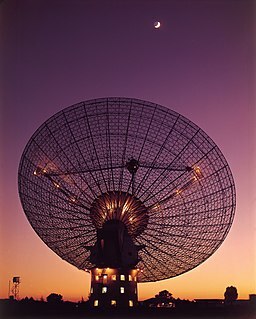 The development of CHIRP involved a team of researchers from MIT’s Computer Science and Artificial Intelligence Laboratory, the Harvard-Smithsonian Center for Astrophysics and the MIT Haystack Observatory, involving Bill Freeman, Sheperd Doeleman, to name a few. It was first presented publicly by Bouman at the IEEE Computer Vision and Pattern Recognition conference in June 2016. Jan Arvid Högbom is a Swedish radio astronomer and astrophysicist. Andrew Chael is an American astrophysicist and a member of the Event Horizon Telescope imaging working group and team that created the first simulated image of a black hole. Sheperd "Shep" S. Doeleman is an American astrophysicist. His research focuses on super massive black holes with sufficient resolution to directly observe the event horizon. He is a senior research fellow at the Harvard–Smithsonian Center for Astrophysics and the director of the Event Horizon Telescope project. He led the international team of researchers that produced the first simulated image of a black hole. 1 2 3 4 5 6 The Event Horizon Telescope Collaboration (April 10, 2019). 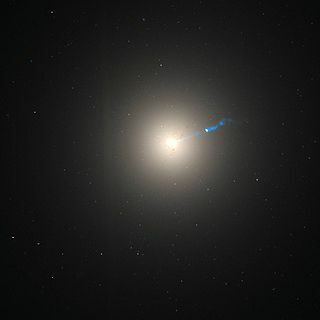 "First M87 Event Horizon Telescope Results. I. The Shadow of the Supermassive Black Hole". The Astrophysical Journal Letters . 87 (1): L1. doi:10.3847/2041-8213/ab0ec7. Falcke, Heino; Melia, Fulvio; Agol, Eric (January 1, 2000). "Viewing the Shadow of the Black Hole at the Galactic Center". The Astrophysical Journal Letters. 528 (1): L13–L16. arXiv: astro-ph/9912263 . Bibcode:2000ApJ...528L..13F. doi:10.1086/312423. Bromley, Benjamin C.; Melia, Fulvio; Liu, Siming (July 1, 2001). "Polarimetric Imaging of the Massive Black Hole at the Galactic Center". The Astrophysical Journal Letters. 555 (2): L83–L86. arXiv: astro-ph/0106180 . Bibcode:2001ApJ...555L..83B. doi:10.1086/322862. Overbye, Dennis (June 8, 2015). "Black Hole Hunters". NASA . Retrieved June 8, 2015. Overbye, Dennis; Corum, Jonathan; Drakeford, Jason (June 8, 2015). "Video: Peering Into a Black Hole". The New York Times . ISSN 0362-4331 . Retrieved June 9, 2015. ↑ Pallab, Ghosh (April 10, 2019). "First ever black hole image released". BBC News. Retrieved April 12, 2019. ↑ "Black Hole Cam". blackholecam.org. Retrieved April 12, 2019. ↑ "EU-funded scientists unveil first ever image of a black hole". erc.europa.eu. Retrieved April 12, 2019. 1 2 "Even Horizon Telescope Organization". eventhorizontelescope.org. Retrieved April 13, 2019. Overbye, Dennis (April 10, 2019). "Black Hole Picture Revealed for the First Time". The New York Times. ISSN 0362-4331 . Retrieved April 10, 2019. 1 2 Susanna Kohler (April 10, 2019). "First Images of a Black Hole from the Event Horizon Telescope". AAS Nova. Retrieved April 10, 2019. 1 2 O'Neill, Ian (July 2, 2015). "Event Horizon Telescope Will Probe Spacetime's Mysteries". Discovery News. Retrieved August 21, 2015. ↑ "MIT Haystack Observatory: Astronomy Wideband VLBI Millimeter Wavelength". www.haystack.mit.edu. ↑ Webb, Jonathan (January 8, 2016). "Event horizon snapshot due in 2017". BBC News. Retrieved March 24, 2016. 1 2 Davide Castelvecchi (March 23, 2017). "How to hunt for a black hole with a telescope the size of Earth". Nature. 543 (7646): 478–480. Bibcode:2017Natur.543..478C. doi:10.1038/543478a. PMID 28332538. ↑ "EHT Status Update, December 15 2017". eventhorizontelescope.org. Retrieved February 9, 2018. ↑ "The Hidden Shipping and Handling Behind That Black-Hole Picture". The Atlantic. Retrieved April 14, 2019. ↑ Mearian, Lucas (August 18, 2015). "Massive telescope array aims for black hole, gets gusher of data". Computerworld. Retrieved August 21, 2015. ↑ Overbye, Dennis (April 10, 2019). "Black Hole Picture Revealed for the First Time – Astronomers at last have captured an image of the darkest entities in the cosmos". The New York Times . Retrieved April 10, 2019. ↑ Landau, Elizabeth (April 10, 2019). "Black Hole Image Makes History". NASA . Retrieved April 10, 2019. ↑ "Media Advisory: First Results from the Event Horizon Telescope to be Presented on April 10th". Event Horizon Telescope. April 1, 2019. Retrieved April 10, 2019. ↑ Lu, Donna (April 12, 2019). "How do you name a black hole? It is actually pretty complicated". New Scientist. London. Retrieved April 12, 2019. “For the case of M87*, which is the designation of this black hole, a (very nice) name has been proposed, but it has not received an official IAU approval,” says Christensen. ↑ Gardiner, Aidan (April 12, 2018). "When a Black Hole Finally Reveals Itself, It Helps to Have Our Very Own Cosmic Reporter - Astronomers announced Wednesday that they had captured the first image of a black hole. The Times's Dennis Overbye answers readers' questions". The New York Times. Retrieved April 15, 2019. 1 2 3 "Astronomers Capture First Image of a Black Hole". European Southern Observatory. April 10, 2019. Retrieved April 10, 2019. 1 2 Lisa Grossman, Emily Conover (April 10, 2019). "The first picture of a black hole opens a new era of astrophysics". Science News. Retrieved April 10, 2019. ↑ Jake Parks (April 10, 2019). "The nature of M87: EHT's look at a supermassive black hole". Astronomy. Retrieved April 10, 2019. 1 2 3 The Event Horizon Telescope Collaboration (2019). "First M87 Event Horizon Telescope Results. IV. Imaging the Central Supermassive Black Hole". ApJL. 87 (1): L4. doi:10.3847/2041-8213/ab0e85. ↑ Högbom, Jan A. (1974). "Aperture Synthesis with a Non-Regular Distribution of Interferometer Baselines". Astronomy and Astrophysics Supplement. 15: 417–426. ↑ SAO/NASA Astrophysics Data System (ADS): Seitz, Schneider, and Bartelmann (1998) Entropy-regularized maximum-likelihood cluster mass reconstruction cites Narayan and Nityananda 1986. ↑ "The creation of the algorithm that made the first black hole image possible was led by MIT grad student Katie Bouman". TechCrunch. Retrieved April 15, 2019. ↑ Narayan, Ramesh and Nityananda, Rajaram (1986) "Maximum entropy image restoration in astronomy" Annual Review of Astronomy and Astrophysics Volume 24 (A87-26730 10-90). Palo Alto, CA, Annual Reviews, Inc. p. 127–170. ↑ "Affiliated Institutes". eventhorizontelescope.org. Retrieved April 10, 2019.